Puglia is way down south in Italy and on the “heel” of the boot. For those who have been to Puglia you know it is a little different from the rest of the Italy, especially from the efficient north. In my humble opinion Puglia is a little wilder and not so designed and styled as the rest of the country, which is part of the charm. There are stunning beaches, olive groves, farm land and cute little towns and villages. 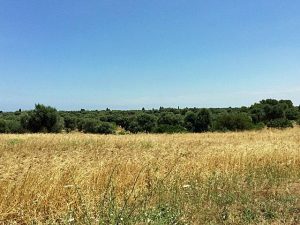 Just outside Ostuni, also called “The White City”, you will find Masseria Il Frantoio sitting on a huge piece of land between the road and the hills. It was built as a small farm in the beginning of the 16th century and during the course of time extensions were added as money was coming in. If you look carefully at the main building you can pinpoint the extensions in time judging by the architecture and building technique used. 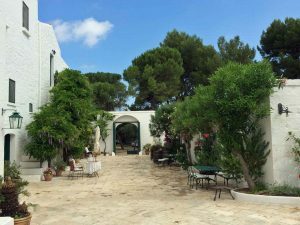 Armando and his wife bought the property 23 years ago and turned it in to a masseria. Today the house is surrounded by herb gardens, citrus gardens and olive trees. Everything is grown organically and either used in Il Frantoios restaurant, their own manufacturing or sold in their shop. Main building with citrus garden in the back of the photo. 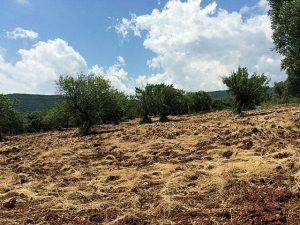 Puglia is very dry during the summer months. When I ask the owner Armando what a masseria actually is he replies: “It is not a restaurant, it is not a hotel. It is like coming home to your very nice grandmother”. The encyclopedical definition is a self sufficient farm or village. This is something the team at Il Frantoio lives by and succeeds with because I felt warmly welcomed and had a good feeling as soon as I had parked the car. Check-in process was very efficient and in minutes we were sitting in the courtyard, relaxing with an aperitif and enjoying the scent from the citrus garden. Before dinner there is a tour of the property which is well worth joining if you are a first time visitor because the tour is done with heart, passion and knowledge and gives further insights on the farm and the hospitality. I am usually very sceptic to eating in restaurants in the middle of nowhere because the management sometimes abuse the fact that no one can drive away after having an aperitif and a glass of wine but this is not the case here. The food is simply amazing and an adventure. Armando explains that the kitchen is not a vegetarian kitchen but many dishes are due to the fact that Puglia is sometimes very dry and meat was hard to find in the dry season. The wine included in the menu paired nicely with our 4 dishes and I was a little sad that I hadn’t opted for the bigger menu. Outside guests are welcome to the restaurant and it is highly recommended for a nice dinner. Organical farming surrounds Il Frantoio. The charming courtyard at Masseria Il Frantoio. That night I fell asleep with a full stomach and a big smile on my face. Our room was equipped with a kitchen and very spacious with all amenities. Our room even had a kitchen but I see no reason to use it when there is an extraordinary restaurant serving 3 meals a day on site. In terms of styling, the rooms are decorated in country house style with semi-antiques and rustic furniture. If you are looking for a slick, ultra-modern boutique hotel this is not the place for you. The only negative part about our room was the very small shower. It worked without a problem, but on the smallish side. Woke up the next morning to Puglian sun and birds singing. Enjoyed the breakfast buffet, did a tour of the lands and the plantations with a very nice gentleman from the staff and then headed for one of the nearby beaches. Il Frantoio recommends 4 beaches within 20 min drive where you get 2 sun chairs and an umbrella for free. I have tried Lido Taverna Da Santos which is black rock and Lido Bizzarro which is sandy beach. If you want to go sightseeing you have Ostuni next door and Martina Franca not far away. All in all, this is a great experience either for dinner or for a few days as a part of a nice vacation in Puglia. I would love to hear from you, so please do not hesitate to share your tips in the comments below, on Twitter or on Facebook. 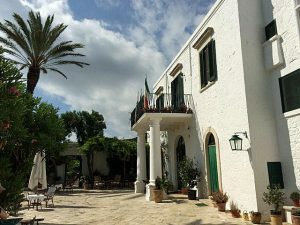 You will find Masseria Il Frantoios homepage here. You might also want to read our thoughts about renting a villa in Puglia here. Why You Should Doublecheck Your Airline Ticket Confirmation. Experience Mi Marbella – an Interview with Mi Ridell!